“You can’t look at a city through just one lens, or you won’t understand it,” says Joseph Evan Gray ’18. Gray, a New York City native, transferred to the University of Rochester as a sophomore to pursue his interest in mid-sized Rust Belt cities. The University as given him access to a wealth of courses—as well as internships with the Rochester city government—to further his studies. Even more, it has given him the freedom to piece those elements together into an urban studies major of his own creation. These are just some of the other interdepartmental majors created by students through the University’s Multidisciplinary Studies Center. The center also administers several University-approved multidisciplinary majors, such as American Studies; Archaeology, Technology and Historical Structures; Data Science; Digital Media Studies; East Asia Studies; and Public Health. 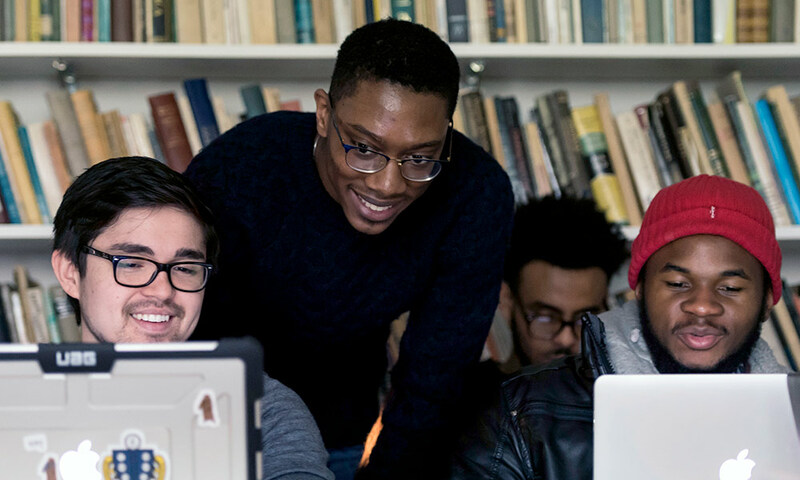 Students who have successfully created their own majors credit the help they received from Jennifer Sherwood, assistant director of the center. 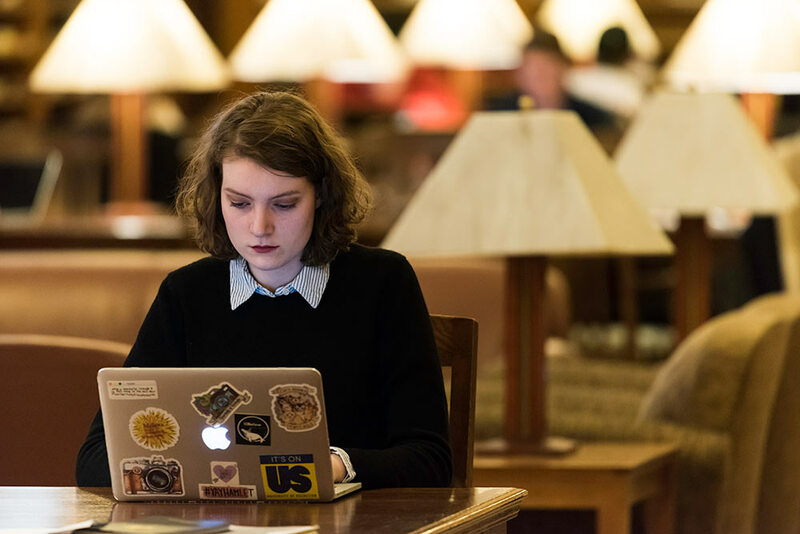 “She was really great at telling me ‘here are the things that you need to do,” says Aliye Gallagher ’19 whose major is Digital Communications: Theory, Analysis, and Practice. Born in Manhattan, Gray grew up in Brooklyn until he was 10, then moved to Italy to live with his mother in rural Sicily until he was 18. But his heart and mind remained in the city. After returning to the United States, Gray completed high school at the Manhattan Comprehensive Night & Day High School for international students, where he literally took classes day and night. He then enrolled as a Higher Education Opportunity Program (HEOP) scholar at Bard College, a liberal arts college in Annandale-on-Hudson, New York. The courses he took there in political science, sociology, and art history helped him “realize that all three came together: the architectural, the social, and the cultural aspects of cities,” he says. With his budding interest in the experience of mid-sized cities like Rochester, he researched the University, and found out about some of the course offerings and the possibility of creating an urban studies major. Gray transferred in the spring of his sophomore year. Gray hit it off right away with the people he calls his two “amazing” advisors: Gerald Gamm, professor of political science, and Joan Saab, professor and chair of art history. Gamm’s Urban Change and City Politics, and Saab’s Representing the Modern City, have illuminated “how the physical setting of cities affects the people who live there,” Gray says. For example, when Gray looks at Rochester as it is now, compared to 60 years ago, he can see how urban renewal and the construction of major highways transformed the city. They accelerated white flight to the suburbs and left pockets of concentrated poverty throughout the city. 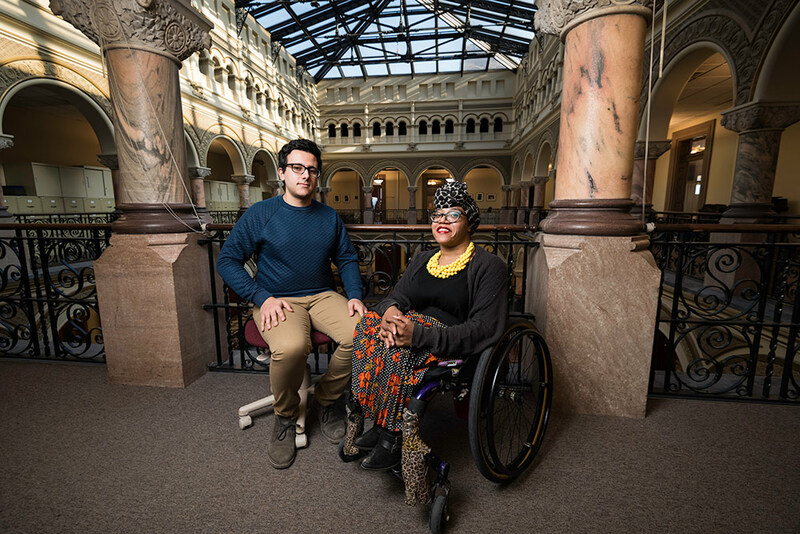 Gray chose his second internship after hearing Luticha Doucette, a research analyst in the Mayor’s Office of Innovation, “give an amazing speech” about the need to improve accessibility for people with disabilities. Doucette, who uses a wheelchair, recounted her own experiences, and “opened the eyes of everyone in that class,” Gray says. After spending a semester surveying the accessibility of Rochester businesses, Gray is now expanding his project. He’ll be researching changes to city policy that could improve accessibility, potential sources to help with funding, and ways to recognize businesses that have made their establishments accessible. “I’m also looking into similar policies that have already been put forth by other cities in the US and Canada and will be in touch with them,” he says. Here’s what really “bugs” Aliye Gallagher ’19. “Miscommunication,” says the University of Rochester junior. “I’m in a room, and two people are talking to each other, and one keeps saying the same thing, and the other keeps saying ‘I don’t understand.’ I want to just jump in, rephrase it, and spit it out,” she says. Exchanges of ideas can become even trickier when the people communicating aren’t in the same room. Miscommunication, however, is not merely a pet peeve of Gallagher’s. It’s an intellectual interest, and one she’s pursuing through the major she created called Digital Communications: Theory, Analysis, Application. 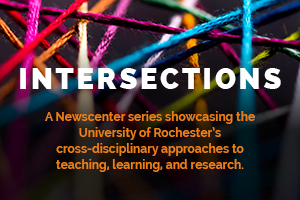 It incorporates classes across a broad swath of disciplines: English, digital media studies, linguistics, psychology, art history, statistics, and American Sign Language. Gallagher, who is from Madison, Wisconsin, learned American Sign Language at an early age from her mother, a therapist who worked with the deaf community. She also fell in love with digital technology. Her father worked in information technology and was always bringing computers home to work on. “I was also playing coding computer games when I was little,” Gallagher says. She became interested in Rochester in part because of its American Sign Language program. But she also “fell in love” with the University’s cluster system after learning about it during a tour of the campus. Gallagher decided to minor in ASL, in order to focus more broadly on digital media and communications. When she searched the list of undergraduate majors offered at Rochester, two of them—Digital Media Studies, and the Language, Media and Communications track in English—included elements of what she wanted to study. However, “neither completely fulfilled all of the areas that I hoped to explore,” she says. By the end of her sophomore fall semester and into the following spring, Gallagher was knocking regularly at the door of Jennifer Sherwood, assistant director of the Multidisciplinary Studies Center, who was guiding her through the steps she needed to follow to create her own major. That spring was particularly hectic. In addition to convincing her advisors, getting approvals from department chairs, and writing essays to win approval for her major, Gallagher was simultaneously working through the process of applying to study abroad the following fall. Gallagher is confident the major she created, and the clusters she’s taken in web design and psychology, will help her make a difference when she graduates. “Everything I’m doing is helping me be able to do the things I love after I graduate,” she says. She is especially interested in improving digital communication in the business world. That might mean working for a digital company like Apple or Google, concentrating on social media, web accessibility, or creating apps. Or it might mean doing digital communication work for any company, she says. “I just really want to get out there and work,” Gallagher says. Farther down the road, she sees herself giving seminars and doing consulting work for businesses, or perhaps going to graduate school to do further research in the field. “Someone from my mother’s generation said to me the other day, ‘when you’re my age, your kids are going to know so much more about the media than you will,’” Gallagher says. By now, Courtney Thomas ’18 knows what to expect when he tells people about his interdepartmental major. You won’t find neuroeconomics on the University’s list of undergraduate majors. Thomas, a Posse Foundation scholar, created it himself. He was drawn to economics and international relations (his other major), and became particularly interested in human behavior and decision making as applied to financial and social capital. Because the emerging field of neuroeconomics examines such issues, Thomas worked with Jennifer Sherwood, assistant director at the Multidisciplinary Studies Center, to create his own major in the field. It was Thomas’s idea to include sociology in the major. “Right now neuroeconomics is the intersection between neuroscience, economics, and psychology,” he explains. Sociology should be part of the mix as well, he believes, because it extends the understanding of decision making beyond the individual (the realm of psychology) into group settings—business networks, for example. He’s considering a number of options to continue his education, including a PhD in neuroeconomics, a master’s degree in public administration, or a doctorate in law. 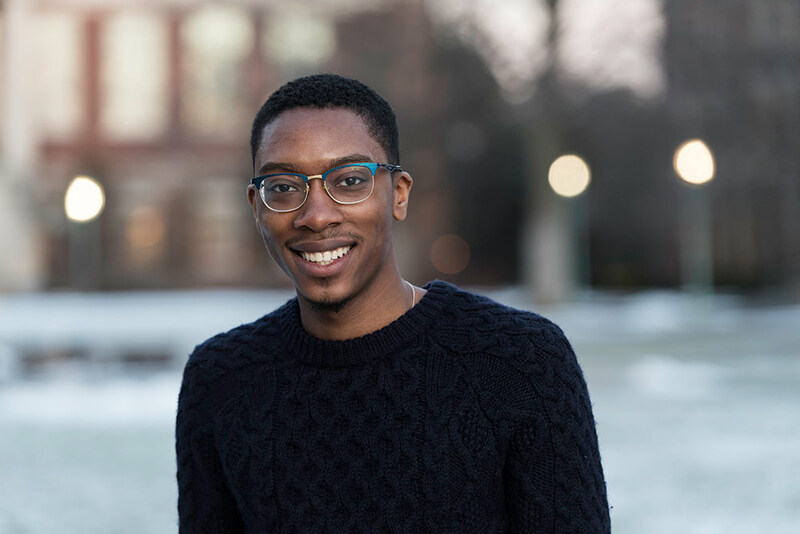 In the meantime, he will remain at Rochester next year as an e5 (formerly known as KEY) scholar, studying how to identify biases in algorithms that are used, for example, to process mortgage and job applications – biases that result in gender and ethnic discrimination. “We need to find a way to eradicate those biases, and use algorithms that can learn to flag and eliminate biases that we as humans cannot even see,” Thomas says. Thomas knows he’s ambitious. But he remains notably modest about what those ambitions signify. “Honestly, I’m just a typical college student, hoping to do some good in the world some day,” he says.